On July 17, various groups joined together for a working meeting to discuss the growth of the non-native Phragmites australis, or Common Reed, in North Carolina’s coastal marshes. Phragmites grows very quickly and can diminish a marsh’s productivity. Photo by Mark Hibbs. The workshop, organized by the North Carolina Coastal Federation, was held at the National Oceanic and Atmospheric Administration (NOAA) lab in Beaufort, in partnership with the N.C. Coastal Reserve & National Estuarine Research Reserve (NCNERR) and the Albemarle-Pamlico National Estuary Partnership (APNEP). The meeting brought together researchers, policy, agency staff, landowners and others with expertise of this invasive species. The goal was to evaluate what is known about the science and management of Phragmites, and to discuss the development of a coastwide management plan to better manage the spread of the plant. Nationally, current management programs point out the difficulty and complexity in managing this species. Once Phragmites becomes firmly rooted, aggressively spreads and grows up to 12 feet high, it can diminish a marsh’s natural productivity and habitat diversity, and be nearly impossible to eradicate. Morgan Rudd, summer coastal policy and restoration intern with the federation, gave a presentation about the current science on Phragmites. She found that 93 percent of Phragmites invasion is driven by disturbance during shoreline development. She presented findings on the ecologic impact of Phragmites within our coastal areas, including both positive and negative impacts of its growth on the native plants and animals, especially macroinvertebrates. Ann Daisey, community conservationist with the federation and the Dare Soil and Water Conservation District, presented on current strategies for managing Phragmites. Techniques include goat grazing, mowing, cutting, burning, biological and chemical treatments. Some eradication techniques temporarily control the size of the plant so that other plants have room to grow, while others kill its rhizomes, preventing it from spreading further. Current management strategies are often combined, with the majority demonstrating successes in managing the growth of the species with early intervention, but few report total eradication of the populations. Karin Kettenring and Christine Rohal from Utah State University presented their findings on best management strategies, reporting on the most effective combinations of approaches and timelines for treatments. Chemical herbicide controls dominate current management strategies by inhibiting the enzymes needed for the plant growth. While successful in killing both above- and below-ground growth, the effect of these pesticides on the ecosystem and human health is currently an issue of considerable research and debate. Morgan Rudd, summer intern with the North Carolina Coastal Federation, presented on the current science on Phragmites australis. Rudd found that 93 percent of Phragmites invasion is driven by shoreline development. Bree Tillett, coastal specialist for the federation, touched on current mapping of Phragmites. Mapping is available for individual sites, but the maps generally utilize imagery that is outdated. She also presented on various types of mapping techniques that could be utilized, including U.S. Geological Survey and U.S. Army Corps of Engineers mapping, remote sensing, citizen reporting and drones. Rob Emens with the N.C. Division of Water Resources Aquatic Weed Control Program talked about the current aquatic weed control program and history of Phragmites control in the state. 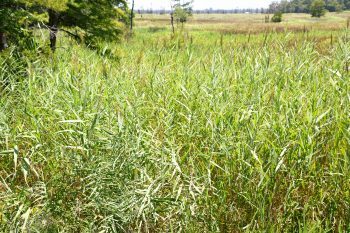 Phragmites is on the North Carolina State Noxious Weeds List, but not on the federal list, allowing it to be taken across state lines. He also reviewed ways that local governments can receive assistance with aquatic weed problems, such as Phragmites. Tim Ellis, ecosystems analyst for APNEP, presented on potential collaborative ways to address the invasive plant. Many of the workshop participants agreed that working with APNEP to come up with a pilot plan to address it in the Albemarle-Pamlico peninsula would be an effective first step. Concluding the day-long meeting, the participants generally agreed that more effort was needed to develop an effective management strategy for Phragmites australis. Future needs were identified, including a solid mapping effort, more North Carolina-specific scientific studies, methods to educate property owners on early identification and treatments, a better understanding of the effect of the plant community on the coastal region and the effects of the current management approaches on the ecology and on human health. Next steps include identifying partners for a working group, obtaining additional funding sources, and creating a pilot management program. To stay updated on the efforts to understand Phragmites australis in North Carolina, please visit nccoast.org/invasive. Click here to download a .zip file of the workshop presentations.